OSWEGO – Mayor Billy Barlow announced today (October 11) the winning projects selected for the city of Oswego Downtown Improvement Fund, part of Oswego’s $10 million Downtown Revitalization Initiative grant secured in 2016. The $545,000 Downtown Improvement Fund project combines individual renovation projects carried out by existing, small business owners in downtown Oswego. There are three types of improvements: Exterior improvements to facades and business signage; interior improvements to ground floor retail and commercial spaces; and renovation of vacant upper floors into high-quality housing. The improvements will create a substantial impact in the downtown. 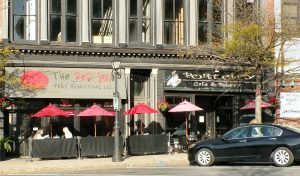 “The Downtown Improvement Fund was designed to give our existing small business owners an opportunity to apply for grant funding assistance to help with façade projects, building renovations, vacant space conversions or business expansion opportunities. The DRI mainly focused on large, multi-million-dollar economic development projects but we wanted to also make sure our small business owners had an opportunity to apply for funding as well,” said Mayor Barlow. “The projects receiving funding are well thought out, quality projects that support our small business owners and is consistent with our broader downtown revitalization plans. These projects will foster additional growth through our downtown and collectively will help push our downtown revitalization efforts forward,” Barlow said. The $545,000 DIF was separated into three different project categories including building renovation and expansion projects, façade restoration projects and small sign and outdoor programming projects. The winning projects were selected by the DIF Scoring Committee consisting of Director of Economic Development Justin Rudgick, Deputy Director Tim Stahl, Third Ward Councilor Kevin Hill, Director of the Oswego-Fulton Chamber of Commerce Katie Toomey, and owner of the River’s End Bookstore Bill Reilly. The Downtown Improvement Fund Committee received 41 applications for funding consideration with a grant request totaling $1.658 million. The 20 winning projects selected to receive allocations are expected to leverage an additional $1.2 million in private investment and are consistent with the comprehensive downtown revitalization initiative outlined in the original City of Oswego Downtown Revitalization Initiative application.